There is something about Potato! Isn’t it? The humble, modest and unassuming tuber grows out of sight, underground and when pulled up it looks like a part of earth. Have you ever seen it competing with other colourful vegetables or trying to take away the spotlight from other vegetables? This spud is neither good looking with frills of cauliflower, nor has beautiful glossy colours of bell peppers. This tuber neither has the clear complexion of white eggplants, nor the radiance of sweet corns. It is oddly shaped unlike slender beans or round tomatoes and sometimes even comes with ugly black spots on its muddy body! Have you ever seen any vegetable seller singing its songs of praise, trying to attract his buyers? When he is praising the goodness and beauty of other vegetables, you will find the dirty sack of potatoes sitting quietly in some dark corner, trying very hard to stay out of spot lights and looks of admiration! That is how I see the potato; humble, unpretentious and highly adaptable. Cook it with any ingredient, vegetables or spices and it transforms into something irresistible. 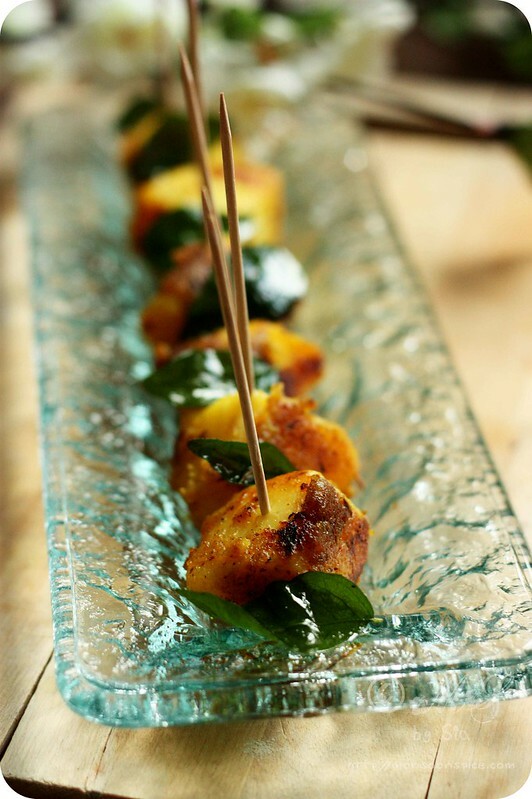 The down to earth and simple looking raw potato transforms into exquisite and tantalising dish! It teaches the great lesson of life that one should never judge a book by its cover. Yes, we need to learn a lot from this humble spud! 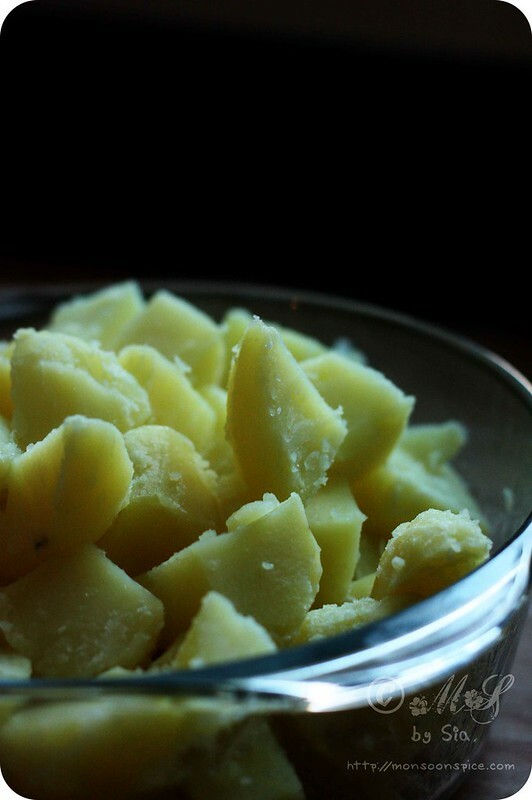 Potato perhaps is the most loved and cooked vegetable in our home. We have to have a potato dish at least once a week or we feel deprived of good old comfort food and act little weird. It may be the carbs or the taste or the ease of cooking or just the fact that they are so comforting makes it our favourite veggie. What not to love? Cook it with any other vegetables and it makes the dish taste better. Cook it with any spice and it enhances the taste. Deep fry, roast it, pan fry, mash it, and cook it whole with its peel or without, the potato tastes good every time! And there is one recipe that will give this spud a very high praise that it really deserves. 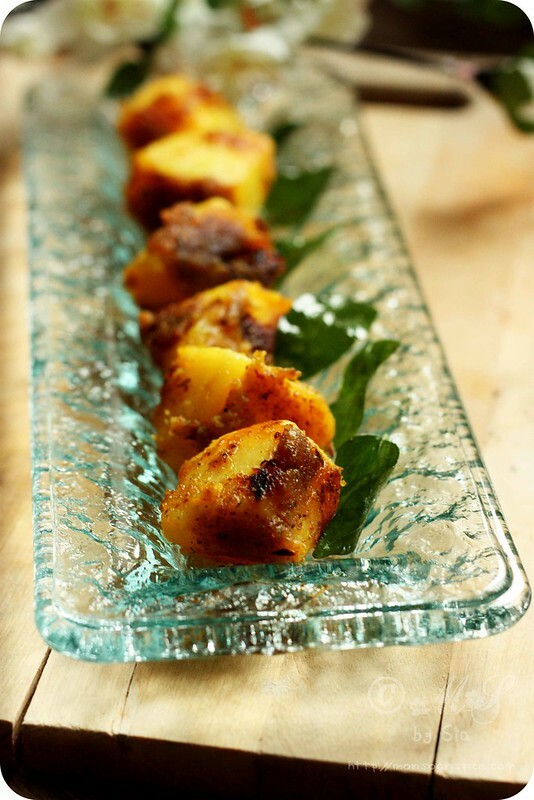 It is simple Masala Aloo or Indian styled Potato Roast with basic ingredients showcasing the versatility of the potato. 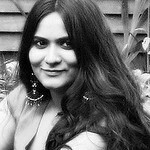 The day I saw this recipe of Masala Aloo at Nandita’s blog, I knew I had to try it soon. The lovely spice crusted Potato Roast kept me salivating for many days and in the end I bowed down to the temptation and prepared this Masala Aloo on one of the busy weekdays. I knew it will taste good, but I was pleasantly surprised to see how much better it tasted than the one I had imagined! The addition of rice flour to cooked potatoes before frying them along with the spices and salt gives it a very beautiful crust with a crunch. And also the tip of adding salt along with the spices and cooking it on low temperature makes the potatoes taste better seasoned. It was devoured by my little and big boys at home and I cooked another batch of these Masala Aloo or Indian style Potato Roast again, with in a week, on popular demand. The ground rice is sprinkled on the peeled and diced potatoes before they are stir fried with the aromatic spices. The spices used are basic spices; turmeric, coriander powder, cumin seed powder and red chillies and thus helps in enhancing the taste of the spud. Feel free to add your favourite spice mixtures and you will still be pleasantly surprised to find a bowl of delicious tasting spuds. I have made few changes to the original recipe and next time I plan to play with other ingredients like garam masala, spicy peanut powder, and some sesame seeds etc to see how they will compliment each other. I have served it as a side dish with steaming bowl of rice and dal and also as a filling for sandwich and rolls with some dipping sauce and salad sauce. 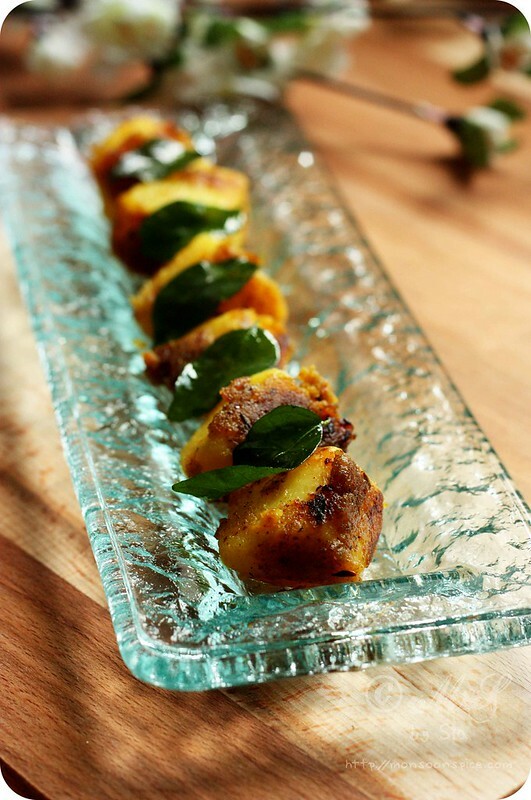 This spicy Masala Aloo or Potato Roast also makes a good option for starter or finger food. Pressure cook or boil potatoes until they are well cooked. 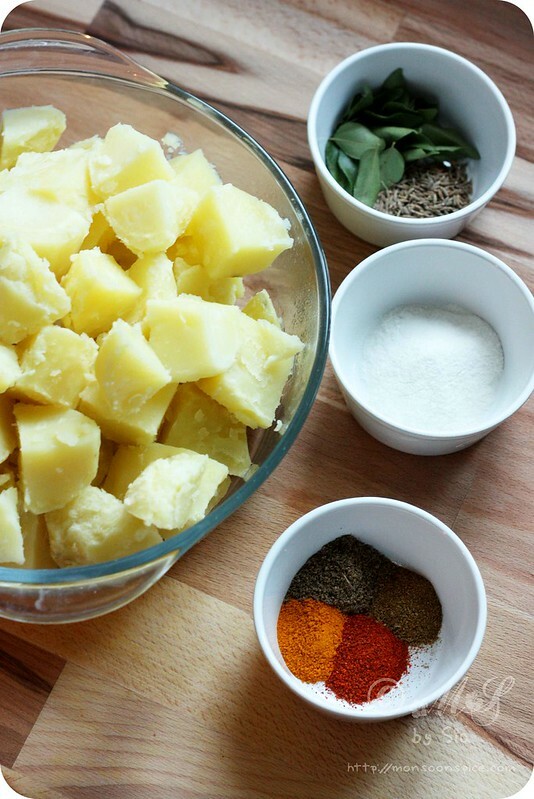 When cool enough to handle, peel the skins and dice the potatoes into 1½ cube. 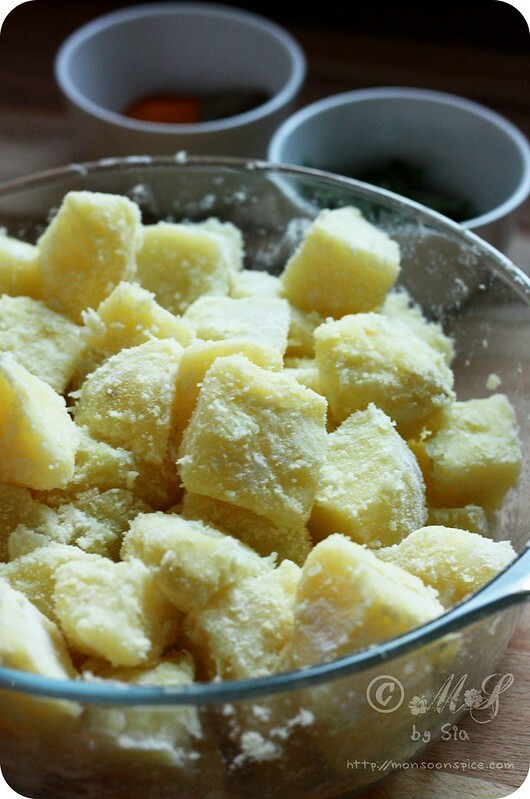 Place the potatoes in a large bowl and sprinkle the rice flour. Toss the potato pieces gently so that each piece is coated well with the rice flour. Keep aside till needed. Heat oil in a large wok or kadai and add cumin seeds, curry leaves and hing. When cumin seeds crackle and change colour, add the coriander powder, cumin powder, red chilli powder, turmeric powder and salt. Stir them for 45-60 seconds on a low flame till the spices as well as the SALT gets cooked. Make sure you don’t burn the spices. Next min in the potatoes coated with rice flour and stir gently so as every individual piece is coated well with the spices and oil. Cook the potatoes on medium to low flame until all the potato pieces get encrusted with spices and turns crisp, stirring occasionally. It took me around 8-10 minutes. The addition of rice flour (finely ground rice) gives the potatoes nice coating of crispiness. Rice flour is easily available at most of Indian grocery stores. Nandita suggests substituting rice flour with corn meal (makkai atta) if you are unable to get hold of rice flour. Adding salt to oil along with spice powders instead of adding at later stage is a tip from one of the famous Indian Chef Sanjeev Kapoor’s mother. It makes the potatoes taste better seasoned. I have served it as a side dish with steaming bowl of rice and dal and also as a filling for sandwich and rolls with some dipping sauce and salad sauce. 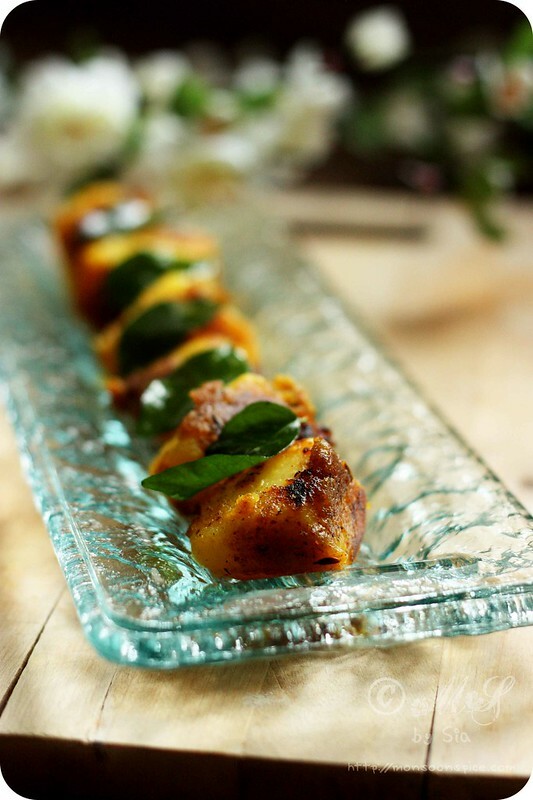 This spicy Masala Aloo or Potato Roast also makes a good option for starter or finger food. 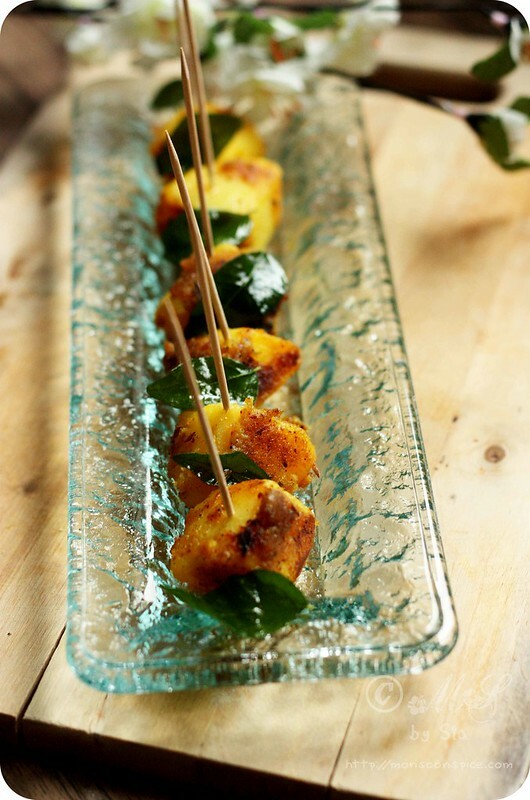 I love potatoes and spices, so this wonderful dish is for me. 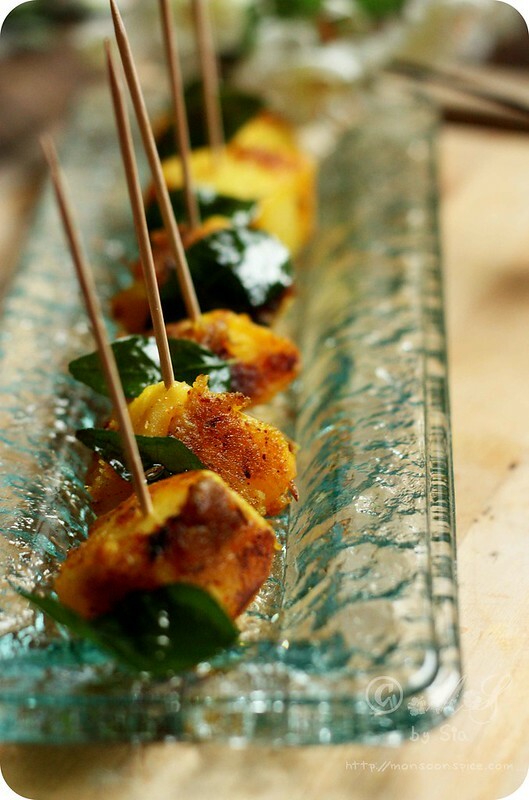 I too have been wanting to try this recipe form the time I saw it on Nanditha's blog. After seeing your photos I can no longer wait! hmmmmmmmmmmmmmmm very tempting and inviting. I absolutely dig the pics! Awesome job! The most incredibly beautiful roast potato photos I have ever seen. A lovely recipe, Thanks for a great way to cook my russets. I'm with Anthony, those potatoes are beauties! I've always thought of potato as the 'supporting cast' to use and abuse, but I see it can be the main star too! LOve the presentation Sia! Looks gorgeous... And I'm a huge Aloo lover :D So bookmarking this immediately for future use. Its so simple and looks so delicious! Humble it is and makes so many belly happy! I absolutely loved the designer plate. And the aloos are gorgeously tempting. Delicious Recipe... Just tried it. My five year old daughter is loving it.. Delicious Recipe... Just tried it... My five year old daughter is loving it. being a vegeterian potatoes are staple in our household. tried your recipe .Tastiest ever. it resembled beef roast. but I forgot to temper but just added curry leaves. next time I shall to tadka too. DOnt know how to thank you Sia for sharing this awesome recipe. loved loved loved it . Bite recipes are my favorite. Great for conversation. A bit of sour cream dip would be divine.